Well, I’m just back from spending a week in Rome, and I thoroughly enjoyed strutting around as a tourist. This isn’t something I do very often, I must admit. Usually when I travel I’m either working or doing my damnedest not to look like a tourist. Standing on a street corner looking perplexed map in hand and a camera slung round my neck? Not I (thank god for smartphones). But then I got to Rome and realised that as I would be walking pretty much everywhere paying HK$168 a day data-roaming charge just to use Google maps was probably not worth it, and if I didn’t have my camera slung round my neck, I’d be diving into my bag so often to get it I would end up with a repetitive strain injury. Go to Rome in late winter/early spring. The weather was perfect, the skies clear, the humidity low and the temperature a cool 14 °C to a balmy 19°C. We never queued for a single museum, and even the Vatican wasn’t crowded.The idea of wandering the narrow streets of the Centro Storico with a million other people in the height of summer makes me feel queasy. If you’re not fussed about 5* service, then seriously consider renting an apartment. There are lots of good apartments if you take the time to look, and they are very reasonably priced for the size when compared to the tiny hotel rooms in most of Rome’s hotels. Do try and get on the Vatican Scavi Tour. It was fascinating, and one of the highlights. If you don’t get to the Collesium, don’t worry – it’s like the one in Gladiator, but rather a mess, and the centurions and caesars outside lower the tone rather drastically. 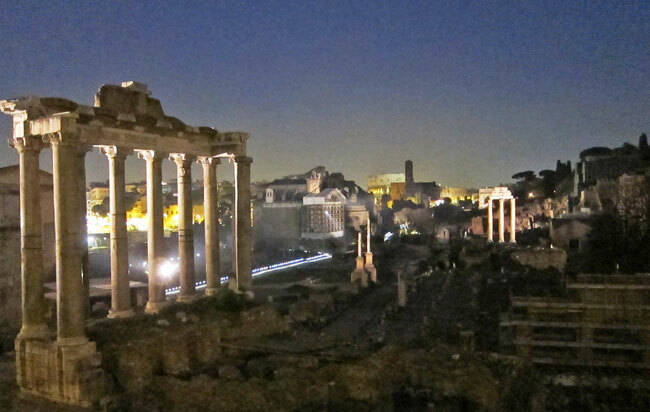 Do go to the Roman Forum and the Palatine Hill – the context it gives you after learning about the Romans so many god-damn times in school makes you wince at the superficial knowledge your teachers imparted. Don’t miss the Pantheon – it’s extraordinary. Even if you only want to go because you saw it during Angels and Demons once you see it and learn a bit about what it actually is, you’ll be truly impressed. The Aventine Hill is a chilled place to watch the sunset over the roofs of Rome, and you can also pop along to peep through the keyhole of the gate to the Malta Knight’s old HQ. Sorry to say, but the taxi drivers are some of the most obscene swindlers I’ve ever experienced. Pick up a Roma taxi guide at their booth at the airport before you leave it so you know what you should and shouldn’t be paying for, and be on the lookout for the switching of banknotes when paying. Much of the food we ate was pretty damn average and on the expensive side. Rome seems to be completely stuck in the past and even it’s modern variations on trad dishes still seem old fashioned. Do your research before you go as you could end up mightily disappointed. The nights Mrs H cooked at the apartment were some of my favourite meals as the ingredients on offer are fabulous. Bring your walking legs as the metro and buses are only good for certain sights, and you’d miss so much by not scooting down the smallest of alleys. Finally, buy the Blue Guide, and not just the concise one but the big tome. The Blue Guides focus overwhelmingly on history and culture rather than shops, restaurants and hotels, so in a city like Rome it is an absolute must. Stuff looking like a geek, it’s more important to know what the hell you’re looking at when faced with the latest unnamed Roman ruin you happen across in an alley, or a statue that could be a Bernini or a Canova. I have the internet for the latest and best hotels, bars and restaurants, whereas history doesn’t change quite so quickly.